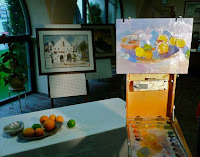 It was an unusually rainy stormy evening in San Gabriel, CA, when a group of people gathered to attend Eric Merrell's demonstration in the Glass Room Gallery of the San Gabriel Fine Arts Association. 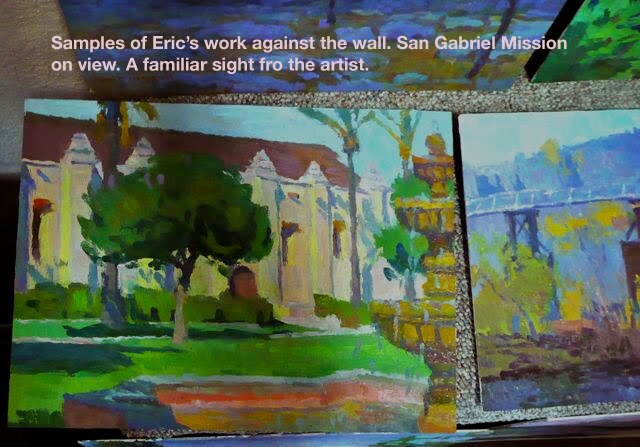 Eric is duly famous for his very sensitive use of color in landscapes. His work breathes color nuance and atmosphere without the burden of heavy detail or elaborate drawing. That doesn't mean there is not a lot of thought and method to his approach as we were about to see. 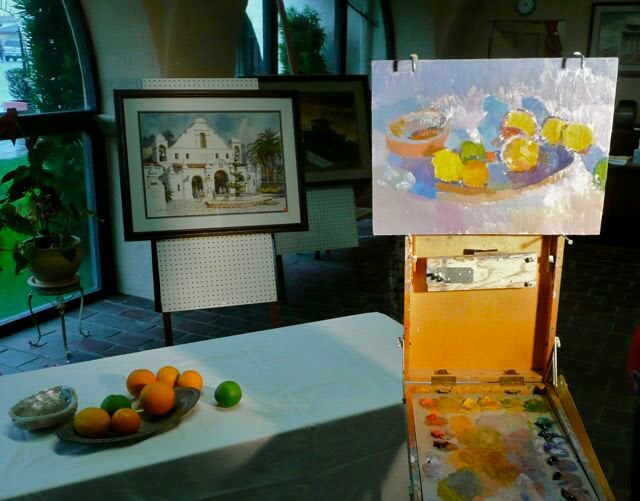 Originally scheduled to paint the mission outdoors, the heavy weather precluded any outing so he settled for a tray of oranges and an abalone shell. The lighting from outdoors was cool and grey. He only set up one single warm light he used both to paint and illuminate the still life. He makes a few marks to guide the composition. Then aims at a color area he thinks he can get down and makes his initial dabs. 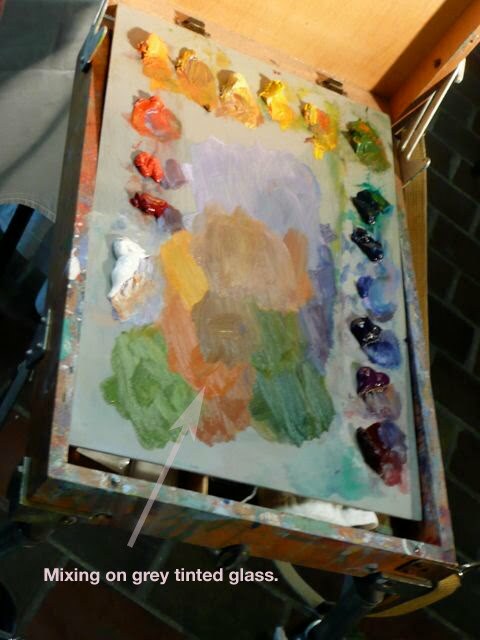 From this initial area, the painting grows in a contiguous march, spreading out slowly and deliberately. The reason for this methodology lies in the need to compare all colors with the adjacent ones. Eric squints constantly and compares each color to the whole for every step. His initial strokes are diluted but not runny. He is just skating the chromatic ground so to speak. 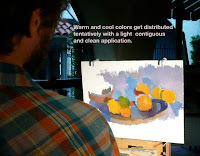 I found this approach interesting as other painters like Calvin Liang and Clayton Beck emphasize color comparisons across the whole piece almost from the start. Choose what works for you I'd say. Eric maintained a pretty clean palette all the way to filling up the board. Despite the fact that he didn't quite finish the piece, he was kind enough to demonstrate a more "finished" approach by really focusing in one single piece of fruit. It was very obvious that he wasn't looking at "fruit" anymore though, just masses of color and changes in hue . He really couldn't just "finish" one orange without retouching the surrounding colors. That is a mark of excellence. There are many lessons in Eric's craft I find: Make your painting about something not some "thing". 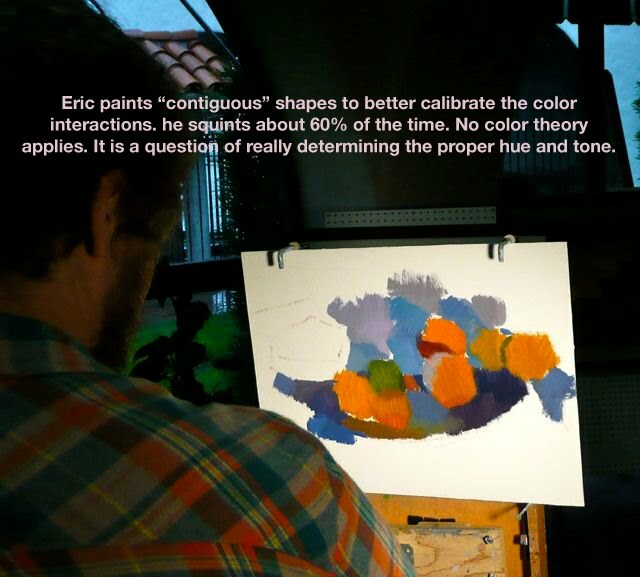 In Eric's case, it's all about the color. 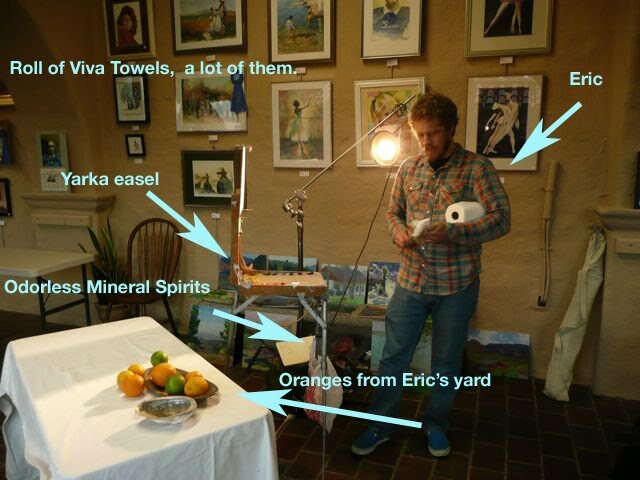 Trying to gather all the information in the world around you and place it in your canvas is a tall order. 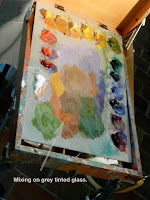 Trying to keep color theory in your head while painting -even as a colorist- can be tricky. 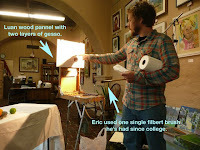 Eric just tries to be as accurate as possible and sometimes , a lot of times, gorgeous color marriages occur. 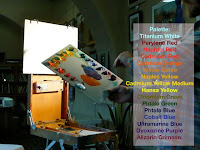 Painting is a "choosing". 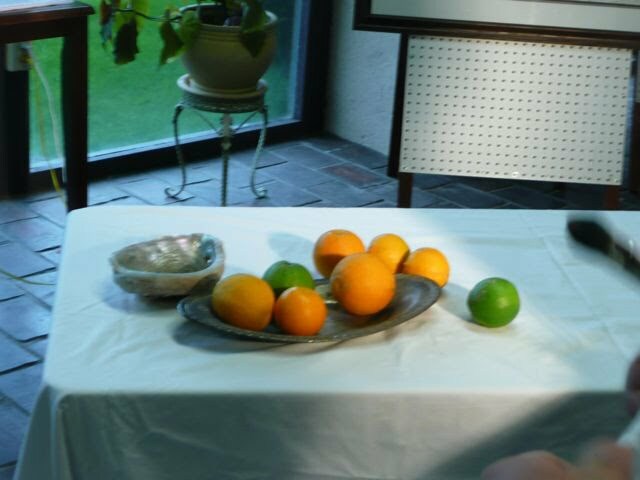 As a consequence there are no oranges of shells or trays but just color interactions, beautiful compositions or arousing light plays. Thanks, Jose! Looking forward to your demo soon!! Thanks for the clear info and explanation! Thanks so much for doing this Jose. You got the all the teaching points..Amazing. I enjoy looking over your shoulder Jose! Interesting post, Jose!! Thanks for a clean, clear explanation!